STAR WARS AFICIONADO WEBSITE: DELETED SCENE: MADINE IN COMMAND! General Madine (Dermot Crowley) and the bridge command crew of his Rebel Cruiser show their readiness for battle in a deleted scene from RETURN OF THE JEDI that finally made it to the Blu-ray release last year, of which we also got to see him say the classic line, "May the Force be with us". 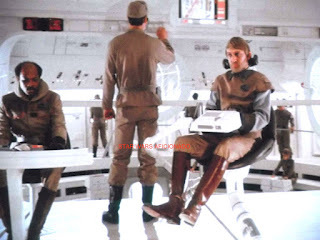 More in-battle footage was shot of Madine in 1982, by Richard Marquand's camera team, which still hasn't been seen or released, including the bridge crew watching the destruction of either the Super Star Destroyer or the Death Star II and cheering! 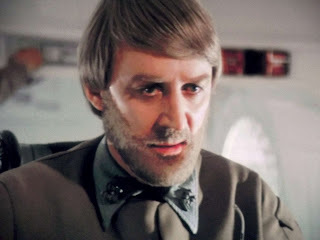 Additional Note: In late 1982/early 1983 post-production for JEDI, it was decided to re-dub Mister Crowley's voice with a US actor: John Hostetter.